Please see our Petition to ban canal estate developments in WA , to be returned by Monday 13th of October 2014. See Development Control Policy 1.8 Canal Estates and Artificial Waterway Developments page 45 (as at 19th September, 2014). Clearing of protective coastal foreshore reserves that absorb the impact of storms and flooding. After Super Storm Sandy, New York in spending $350m to build a vegetation buffer around Manhattan to shields the city against floods and stormwater. In WA we are clearing coastal vegetation and building vulnerable housing estates in its place. Privatisation and commercialisation of reserved public land for exclusive housing and a pleasure craft marina for the benefit of a few. This is not fitting with the traditional cultural and heritage values of the site, which has been for generations an affordable sea side location for family picnics, day trips and holidays. Not for the champagne set. Loss of public green space in a rapidly growing region. Safety issues, if dredging and maintenance of the marina are not carried out properly, as seen recently at the Ocean Reef Marina, where poor maintenance cause a yachting accident. Resulting in members of one of the clubs calling for the marina to be closed, until dredged properly. Perth is one of the windiest cities in the world. The windiest point on the Perth metropolitan coastline is Ocean Reef. This may be great for Yachts, but it is not suitable for housing (see image below). 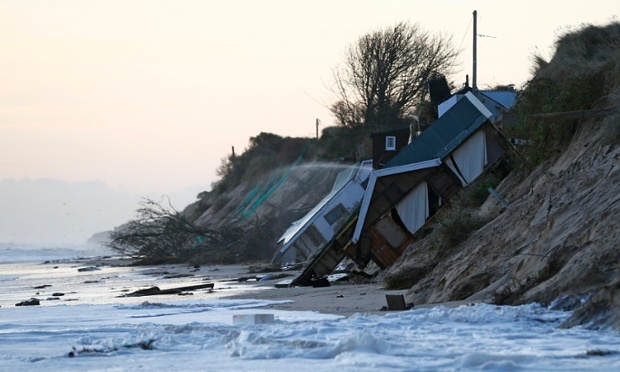 Inevitable damage from more extreme weather events, such as cyclones and storm surges going forward, with potentially massive costs to tax payers and uninsured or underinsured property owners. The floor heights of canal houses are set to accommodate sea level rise and small storms, but are not adequate to protect from the major storms that are being predicted with climate change along our coast. See the recently released report by the Climate Institute and Choice – Buyer Beware. In the event of a destructive cyclone with storm surges around Perth or any of our major towns, the damage would be extensive. The developers would get off scot free, because they follow planning regulations set by the State Government and therefore act within the law. Insurance companies do not cover for inundation from the ocean and very few cover for flooding from storm surges, especially in high risk coastal areas, so they will not suffer too greatly. If they were hit hard, premiums go up or disappear completely. The State Government may not be too concerned, because the Commonwealth Government typically fork out for natural disasters, often borrowing from banks to cover the costs. The big winners are the building and construction industry, because they go into over drive, charging premium rates to rebuild. This drives the cost of building and materials up for everyone. Cyclones bring storm surges, that can do more damage than the wind and are rarely covered by insurance. A couple of insurance companies still cover for storm surge in WA, but only if there is damage from the cyclones wind as well. Very few people will find that they are covered for this type of “inundation from the ocean” or “action of the sea”. Click on this image and go to the video. 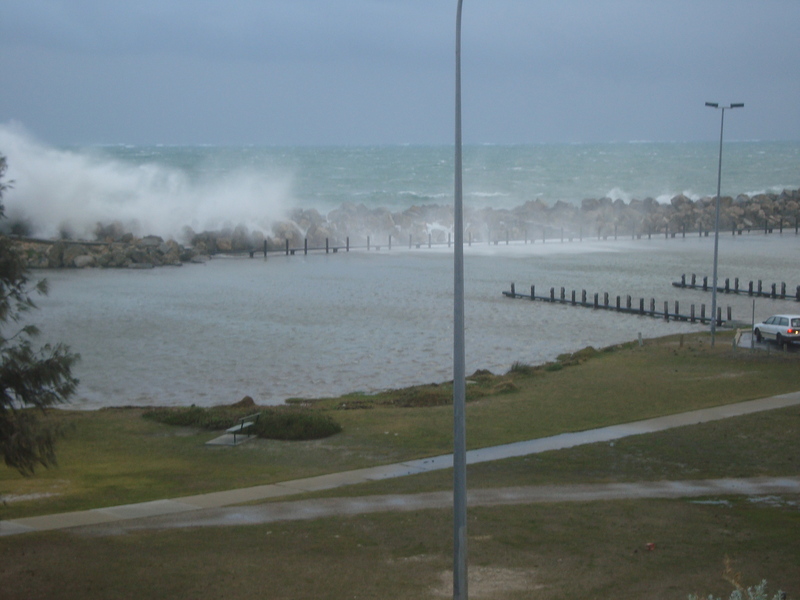 Perth at risk of cyclone flood “Mr Baverstock said if Perth was affected by another cyclone that coincided with unusually high tides and forecast sea level rises upwards of 50cm, the city could be faced with a “wall of water effectively as high as a tsunami”. The Impact of Climate Change on Insurance against Catastrophes (Australia 2003). Australian Government’s Geoscience Australia – OzCoasts predictions for sea level rises (without storms or other extreme tidal events). Do coastal shires have Storm tide evacuation maps ? Cyclone over WA (image from the documentary Countdown to Catastrophe episode 3 – Storms). Click on the image to view the documentary. Storm surge from hurricane Sandy pushing in to the harbor. 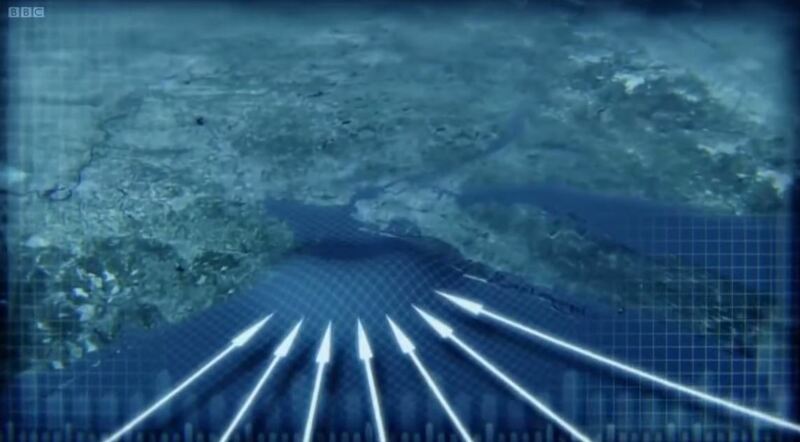 This computer simulation demonstrates how properties in canal developments in estuaries can be affected by storm surge in extreme weather events. It is unclear if floods caused from a storm surge pushing up the Swan River from a storm off Fremantle would be deemed “flooding” or “storm surge” for insurance purposes here in Perth? The Truth Is In The Flood Maps The Globe Mail, May 2012, article about home insurance after the Queensland floods (see part 1 and part 2). Would Perth cope with a 100 year flood? This entry was posted in Bush Forever, Canal Developments, Climate Adaptation, Climate Change, Coastal Vegetation, Environmental Protection, EPA, Extreme Weather, Green space, heritage, Storm Surge and tagged ban, Canal Estates, Climate adaptation, Climate Change, coastal development, enviironmental, insurance, Mangles Bay Marina, Ocean Reef Marina, petition, risk, sea level rise, storm surge, WAPC, western australia. Bookmark the permalink. This land was given to the people of WA. It is not the Council’s to sell! Build the Marina on Rockingham foreshore, where plans are in place. Not what the community wants, not what rich people need. Canal developments pose a risk to existing infrastructure (housing, water supplies) that does not appear to be considered under the existing TPS they may make additional profits for developers but the government shouldn’t be in the business of increasing developers profits at the expense of adjoining land owners or existing infrastructure. How many people actually use the boats they have parked outside their ‘little Venice’ in Mandurah and at what environmental impact? Please learn by our mistakes! We are sick of governments unfair developments just to canvas money for their parties! Make the world more liveable for more people not just a few for a short time! Healthy environments for healthy people! Point Peron is too unique, too precious and too pristine to be lost forever to short-term profiteering. Let’s keep the park that was given to the people of Western Australia for the people. This land belongs to the public and the public doesn’t want it sold to benefit a few. Government also needs to learn that canal developments don’t work and there are too many environmental as well as physical risks such as increasing storms due to climate change. Point Peron needs to be left in its natural state. That’s what people want and also tourists want to see as well! Why on earth does the government not look around instead of blindly copying the mistakes of others. Are they that stupid or are we for voting them in! Get a life people, build heaps of canals I reckon. Theres bugger all else to do in Perth. Some of the most exciting places to visit in Perth are Fremantle, Hillarys and Mindarie Quay. Some people are never happy with any change. I bet you lot are all tree hugging hippes, go live out in the bush!! 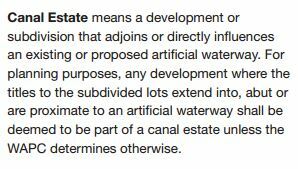 Don’t get confused between ‘canal estates’ and marinas. We are very supportive of the Port Rockingham marina proposal off the Rockingham foreshore/cafe strip. 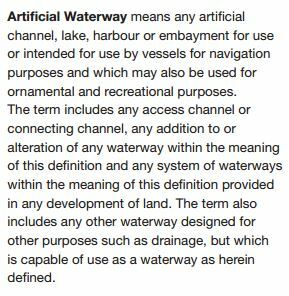 Marinas are built in the water not inland. See http://www.oneperth.com.au/2012/01/20/moment-of-truth-for-port-rockingham/ . This development does not have a residential estate. Though fully approved it is on hold because the developer ran into financial problems and they can’t find investors (not even in China). Makes you wonder how Cedar Woods and Landcorp will find investors for all of the facilities they are promising? It isn’t about what you want or what a few cashed up boaties want, encase you have not noticed the boom is over. We desperately need to diversify and tourism is one of our best bets. Tourists don’t want artificial inlets and marinas, they want nature, pristine unspoiled nature, according to the market research http://ow.ly/RinPu . What you are going to see here in Perth is a lot less disposable income and a hell of a lot of boats for sale. You might still think that marinas are a pretty neat idea, but a large number of Chinese tourists for example are now very sophisticated, highly educated and far more evolved that most of us, marina hopping and sipping crappy cappuccinos is not going to do it for them.